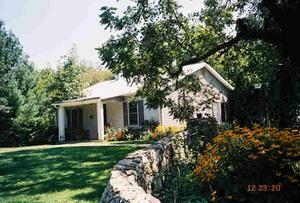 This Irish themed cottage was built in 1998 and has all the charm of a typical European cottage. It's a vaulted ceiling/loft bedroom floor plan, with ceilings fans, skylights (No light pollution here: You can actually see stars!) a big, arched window overlooking a 20-acre horse pasture. Gas fireplace, Claw & ball/shower tub, pocket doors, deck, W/D connections, and fully carpeted throughout. This cottage would be suitable for one to two people. All lawn care is provided by the farm. ALL electric is INCLUDED in the rent. A well behaved pet considered with pet deposit. The inner artist (or real one!) will love the beautiful private setting to inspire creativity amidst nature. Rents for $900 per month. Requirements: Security Deposit, first month rent, pet deposit if applicable; 12 month lease; credit and background check--we will work with your credit glitches if you are honest and hard working but please no druggies or felons. Immediate occupancy is possible, may consider short term (Inaugural) rental. Idyllic setting surrounded by large farms yet just minutes from Gilbert's Corner is this ultra cute 70 year old Cape Cod. Surprisingly spacious, it has 4 bedrooms and two full baths including main floor master. Two BRs on main level, two upstairs. Freshly painted and many updates. Stucco with standing seam metal roof, plaster walls, hardwood floors and high ceilings, too! Nearly 4 acres entirely board fenced, renovated old barn with loft, wide center aisle, 3 stalls, feed/tack rooms. Back yard has pet/toddler fencing and nice deck. Walk out basement. Very private yet close in location for commuters...less than 15 miles from Dulles. Across the street from Miran Farm, large equestrian facility with indoor/outdoor arenas. REDUCED!$595,000 call Julie (540)364-9480 or Isobel for (540)454-2041 to see it. 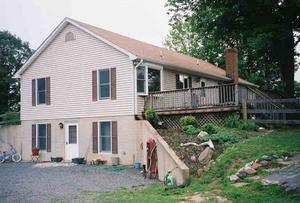 Three bedroom, two bath one level cottage on gorgeous 125-acre farm just 4 miles west of Warrenton. It's very cute inside and much bigger than it looks! Very private yet just minutes from town located on immaculate, beautiful farm...one of the jewels of Warrenton's fabled hunt country. Very private, very serene and pretty setting. Home is freshly painted, new floors/redone kitchen and baths. Has 3BR, 2 full BA, LR, DR, family room with fireplace, and private deck--all on one level. New furnace/CAC, economical LPG heat, forced air. $1575/mo. Prefer adults. Working polo farm--no horse facilities available. Call Julie (540)364-9480 for details. Located in a rapidly growing area of Loudoun County 15 minutes from Dulles Airport. Nestled at the end of a country lane steps from the quaint village of Aldie in Loudoun County is this rustic 4BR 3BA log cabin on 7.75 acres. Well built cabin has many unique features including Vermont slate in foyer, 18x20 family room with massive stone fireplace. One level home has 3BRs and 2 full BA upstairs and finished walk out basement that could easily be an in-law/guest or au pair suite. It contains a rec room with fireplace, additional bedroom and full bath and even a partial kitchen. 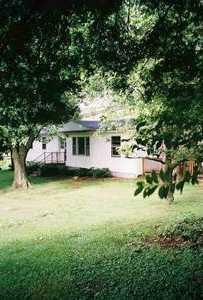 There is a 2-car garage and a large rear deck overlooking woods and meadows. The land offers several interesting possibilities. It’s located in the village of Aldie and both the existing house and additional homes can be connected to the Aldie sewer system (cabin currently served by a septic system). New survey and two new Health Dept. approved wells drilled for possible family subdivision into two additional building lots are available for the purchaser. TEMORARILY OFF THE MARKET FOR UPDATING...CALL FOR INFO! Soar with the eagles atop your own mountain--supreme privacy and finest views east of the Rockies, yet ideally located between Warrenton and The Plains just minutes to I-66 and 45 miles from downtown. Direct line-of-sight view to Washington D.C. plus 360 degree sweeping panoramic views of the Blue Ridge and Bull Run mountains. Stone and brick Tudor-themed home of approximately 14,000 square feet has every possible amenity, nine fireplaces, seven bedrooms, befittingly built like a fortress on steel frame to withstand 125 mph winds, ballroom, elevators, located on top of a mountain on 82 acres (more land is available). Pool, spa, teak woodwork, Italian tile in all bathrooms, built to take advantage of views in every direction, situated amidst similar large estates. Close in horse country, here is a ton of house for the money. It's just minutes from Dulles and convenient to Herndon, Sterling, etc. minutes east of Middleburg and about 10 miles south of Leesburg. Over 3,000 sq. ft. of finished living space--don't let the picture fool you, this house is bigger than it looks! Could ideally accommodate large family or inlaws, or singles looking for a home to share. Three or four bedrooms, 3 full baths, fully fenced yard for dogs and/or tots, big deck for cookouts and entertaining. This 5 yr. old rancher is located on the 25 acre Dancing Horse Inn and equestrian center and sits on its own private acre. Large rooms, modern appliances, econ. forced air heat and CAC. Upstairs has large master BR with private bath including jetted tub. There is a second BR and full bath on main level as well. Big living room with bay window overlooking the Bull Run Mountains, and country kitchen with top of the line appliances--dishwasher, stove, fridge, etc. Lower level is fully finished and includes 3 more rooms...home office anyone? One or two are suitable for bedrooms. A third full bath serves this level, which has its own walk out entrance. Bonus: large unfinished storage area with extra chest freezer for your Price Club trips. Located on Red Hill Rd. about 2 miles NE of Gilbert's Corner in Loudoun County. Rent $2200 per month, avail. July 1 or possibly sooner. Note: current tenant has discouraged showings while she's in process of moving out so please feel free to drive by. If you like the location call me and I'll try to get you in. It will be vacant and avail. to be shown after June 18. Directions: 50 west toward Middleburg. Right on Watson Rd. (Rt. 860) Watson is the last left you can take before Gilbert's Cor. (Intersect. of Rts 15 and 50). Go down Watson about 2 miles and turn right on Red Hill and the house is the 2nd on the left, 40736 Red Hill Rd. APPLICATION ACCEPTED FOR SHORT TERM LEASE AUG. 22. pLS. CHECK BACK SPRING/SUMMER 05! SOLD but we have others! huge PRICE REDUCTION--FIRST $225,000 TAKES IT, reduced for IMMEDIATE SALE from $289,900 Small lots in NW Fauquier are hard to find; here's the best deal on the market today. Your dream of a place in the country can come true now. HURRY--this is BY FAR the lowest priced small lot in northern Fauquier. It's in the Freestate area, just south of Marshall and near Orlean. 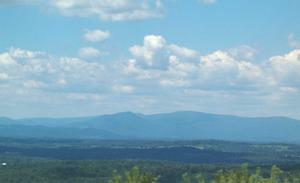 Just 15 minutes from I-66, near Orlean. At this price, you can BUY NOW, RESELL NEXT SPRING FOR A PROFIT!! 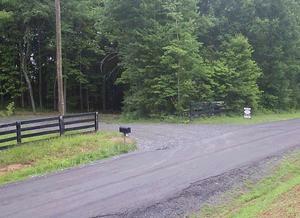 Actual acreage 6.9, mostly wooded but a beautiful cleared building site is ready to go. 4-BR perc is being updated. A good driveway is installed and ready to go (shared with 2 other properties of 9 and 55 acres). NO homeowners' association, NO covenants or restrictions or fees. Located on a quiet dead end road and YES it's paved! Amidst large farms and very private. Call me today for a plat and go have a look--very easy to see the property lines which are flagged. Directions to drive by: I-66 west to 2nd Marshall exit No. 27. Left off ramp to immediate right on Crest Hill (Rt. 647). Go 5.5 miles to a left on Wilson. Go about 4 miles to a right on Conde; then left on Olinger Rd. (Rt. 764). Go 3/4 of a mile and Lot with my sign is on the left. After curve in the drive the lot is the boundary and the property is on your right. WATCH this space; I'm going to go take some new pictures since the leaves are in PEAK BLAZING color. With a lot of the undergrowth died back, you can actually see the topography better now too. CALL Julie at (540)364-9480 or e-mail juliereardon@mris.com, and I'll fax you the plat. HURRY IT WONT LAST and the owner is MOTIVATED TO SELL! ORLEAN--HUNT BOX for RENT hack to meets! Available with stable/4 stalls & ample turnout including spring fed pond, for extra $125 per horse see Hope Springs Farm barn rental for details--this cottage is next door. Requirements for tenant applications: Good credit, good references and 1 month rent security deposit. Negotiable but could include horse board, lawn maintenance, hunting rights, etc. 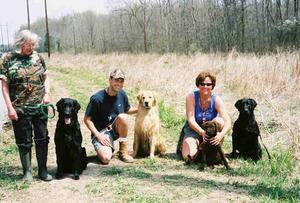 Pets on case by case basis with pet deposit. Hard to find affordable rental for either a horse person or someone desiring privacy. Beautiful, 6-stall stable with heated wash rack, tack & feed rooms and spacious, almost new 900 sq. foot apartment above with one BR, deck, nice kitchen, washer & dryer. 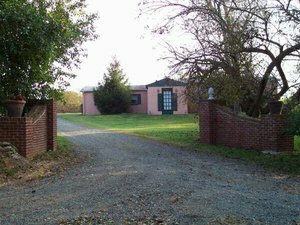 Located on absolutely beautiful 91-acre farm with endless mountain views just minutes from I-66 Markham. Apartment rent only $850 per month, plus $50 per horse per month/negotiable. All grounds maintenance is included in rent. Tenant pays utilities. The farm is owner's weekend residence and tenant may have use of the swimming pool! Requirements: credit check, first month rent & pet deposit. Available in APril 2008...please call for appointment. Want peace, quiet, beautiful rural setting on a historic country estate, yet only 30 minutes from Gainesville (VRE opening there in 2009!) AND only 1 hour to DC? YOU FOUND IT! Just 8 miles west of Warrenton, but oh so easy access to city. 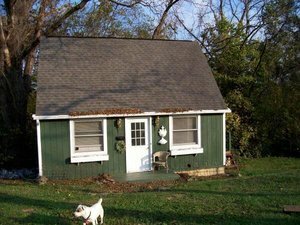 Adorable renovated cottage on a very private, 30+ acre horse farm well back off a country road but only 8 miles from Warrenton. Home has been completely redone, has huge kitchen, living room, 3 bedrooms and 2 baths. Private fenced patio in back. 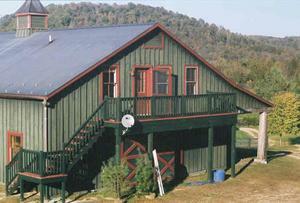 You'll love "The Cross House" on equestrian training estate. Approx. 1400 sq. feet, all on one level, with BIG country kitchen, with 10 foot ceilings, ceilings fans and large windows throughtout. Central A/C, W/D, carpet and new flooring and oil heat. MBR with ensuite bath easily fits king size bed; 2 additional BRs and second full bath. Possibility of horse board--location is on a working horse farm near Warrenton and foxhunting, horse shows, etc. Call Julie at 540/364-9480 for more information & schedule an appointment to see this property. Additional Info: Cottage has a privacy fence and patio area ideal for a dog. which is ideal if you have a dog. The other two bedrooms are located on opposite ends of the house and offer privacy from each other. Rent includes all yard maintenance and use of the on-site dumpster. Well behaved pet(s) considerd. Artist or animal lover's dream! Available for immediate move-in. Serious inquiries only. 15045 Peregrine Drive at Route 211 to see or for more information. Beautiful older home on nearly 4 acres of parklike meadows, old stone ruins and babbling brook in the village of Upperville. Historic pre Civil War home has been renovated/added onto and has many unique features. 3 bedrooms, 2.5 baths, formal living room, large kitchen/family room combo, working fireplaces, screen porch, summer kitchen, 3-season enclosed gazebo, inground pool. Rarely do you find a home like this in a village setting with such privacy and charm.